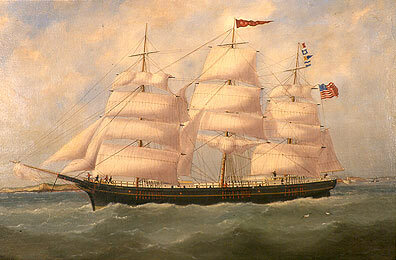 This painting of the ship Elizabeth is attributed to Marie Edouard Adam, c.1883. It was mostly Searsport sea captain capital that financed Elizabeth, built in Newcastle, Maine, by Haggett & Co., and named for the wife of her first master, Phineas Pendleton III. 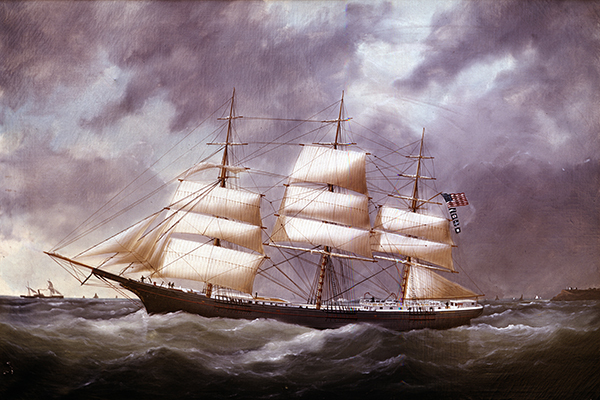 Launched in October, 1882, she went ashore nine years later at Rocky Point, San Francisco. Elizabeth’s wreck is a story of loss for four Searsport families. Her master, Captain John Herbert Colcord, was travelling with his wife and two children, who were saved, although he died. In 1866, the William McGilvery yard in Searsport, with Marlboro Packard as master builder, built Oneida. McGilvery owned her until 1879. Other Searsport residents then bought her.